Black Hole. What is Solitary Confinement? This post is not a letter from Jamie. I’ve written about ad seg or solitary confinement in many of these posts. 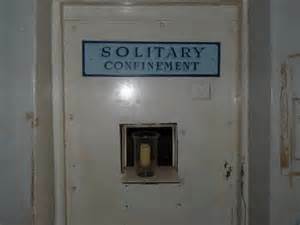 I think many people have a vague overall idea of what solitary confinement means, but not really. So when I came across this I decided to post it here as well as inserting the link on the left side of the page where there are other links you can tap into. When you realize how awful it would seem if you tried to visualize yourself in this situation, think of how it would be if you were left there for months, years or decades. Most likely you would go insane, and if you had any problems dealing with things before you went in, your time there would be even harder. Some inmates have done violent things and if they were put into gen pop ( general population ) they may still hurt people. But, if they’re isolated, and out of harms way, why do they have to also have to tolerate torture? They may be sentenced to life without the possibility of parole, but did the sentence also include a clause that allows their jailers to make sure they’re as miserable as possible and make humiliation part of their sentence? In addition to these dangerous people there is also a large percentage of people who aren’t dangerous and are being held there simply because of the color of their skin. Some are imprisoned as a way to shut them up. Freedom of speech isn’t always free. There are many reasons why people could find themselves locked up in solitary. There are many inmates, if they were allowed to do their sentence in a constructive atmosphere, even if they were sentenced to life without parole, and be able to do it in such a way that they can still develop a life inside, wouldn’t it benefit everyone? By allowing them the use of a library, correspondence classes or other means of rehabilitation they may not go insane from the deprivation of anything related to life. If recidivism is lowered then every cost goes down. Does a gang member, who was raised in the gang culture from childhood, who decides to join a gang because it seemed the only one way to go, and was then incarcerated for whatever reason, does that mean he doesn’t deserve a chance to help himself rise up from that and then maybe help others to not follow that path? Maybe then the return rate to prison would go down. If the prison system doesn’t change the way they do things might, there be another reason they want to keep the prisons full? Could it be the Prison Industrial Complex, which makes a ton of money from keeping the prisons full? There’s a website in my links list called Solitary Watch. They’re letting the voices of the inmates be heard. It’s a site well worth going to. All of us are a product of our childhood. How we were raised, our influences, our family, or lack of family, determined how we started out in life. Many of these men and women, after understanding it was their life choices that brought them to where they are; shouldn’t there be a way for them to make amends if they can, or at least be able to make better causes that will in turn have better effects, even if the rest of their life takes place inside a prison? They are still human, and none of us are perfect. Every single one of us has done something that would qualify as a crime. We just didn’t caught. We get outraged when animals, even chickens are raised inhumanely. Can’t we have that same rage for humans? At the top of the website are two links (soon to be three links). He was a gang member and he’s Hispanic. They have a special place for them in the SHU (special housing unit) at San Quentin. He was in and out of jail and prison most of his life and is now inside for a contract killing. He’s on death row, but that issue is now, hopefully, being taken off the table very soon. If they aren’t going to kill him, will he still have to spend his entire life completely unable to ever feel the touch of another human being, and never be allowed to hear the voice of a loved one on a phone call? They say phone calls are a privilege, but it’s a privilege that can never be earned. He’s only 34. He has a lot of life left. In the SHU they’re allowed even less than other people in solitary confinement. Before this, even other times he was locked up, he had never really thought about his life. He never wondered why he chose to do the things he did. He was told to kidnap and kill a man, so he did, never really thinking about the consequences of what he was about to do. He didn’t wonder why he was going to kill this man, he only knew it was for money. If you’re told to do something and you don’t do it, you could be punished by your gang in severe ways. It’s easy to see that the concept of right and wrong was never instilled in him growing up. Something was missing. We can’t know and understand these things if we haven’t been exposed to that teaching by the adults in our lives. He told me he had a violent upbringing and was beat every day. What does that teach you? Does it teach you value for human life? This time in prison Armando found Buddhism which concentrates on our human nature and the law of cause and effect. Through years of meditation and seeking answers to understand why he is the was he is, he realized what he had done and chose to rehabilitate himself even though the prison system was trying so hard to destroy him. He found a way to structure a life inside his tiny cell. My letters from him are sincere and honest. His connection to me is one I know he cherishes. I help give him a connection to life. He has an outlet to express himself and someone who listens. I,too, have learned many things from him. I know I have taken on a lifetime commitment and it would be a blow if I ever severed that communication. I would never be afraid to be alone with him in his cell. He is not a danger to anyone. My commitment to Jamie is also lifetime, but he’s family and we’re connected by the blood of my grandson. Between the years of letters from Jamie, who will be able to get out someday, and Armando, who will never get out, it has given me a deeper insight to what being isolated really means. In the beginning I didn’t really understand, even though I knew what the words meant. Now, having two half black grandsons, ages 6 and 8 and living in Texas, which is very racist, it scares me to know this racism will follow them throughout their lives. I know people will look at them and judge them by the color of their skin. They will be looked at as criminals if they are dressed the wrong way or have an expression on their face that someone thinks has criminal intent behind it and call the police because they suspect, wrongly, they may be a criminals. They’ll have to go through their life knowing that at anytime a cop could slam them up against a wall or shoot them for no just reason and get away with it. It scares me. It scares me so much. Our injustice system doesn’t need a reason to put a black man in prison, or a child in juvenile detention. On this chart below, it shows the recidivism rate for people getting out of prison and going back in. When someone don’t have a way to learn and when he hasn’t had a way to relearn his value system, get the help he needs to acquire an education so he can make a living, what happens when he gets out? He goes back to where he is from. He may even have the resolve to do things differently this time around. He finds his friends again, possibly the only ones who showed him any caring in his life. He gets sucked back into the only life he knows and understands. The states complain about all the money spent to support inmates. They don’t like to pay for good medical care, so inmates often go for long periods of time before any issue is resolved. Every type of service is skimped on. They don’t do what is needed so these people can lift themselves up so they don’t end up going right back inside. It gives meaning to the phrase: If you continue to do what you’ve always done, you’ll continue to get what you’ve always got.